Early schooling in Kororareka was a religious affair with Māori children receiving the first lessons from Marist Brothers on Pompallier Mission Station grounds in 1839. After a Catholic chapel was built in 1840, the Brothers offered weekday classes to European children. At times up to forty children attended. It seems “the want of the means of education” was still being expressed by concerned parents, for, in September 1840, Rev B. Quaife announced his intention to start a school in the Spring quarter while in December 1840, Mr. Gibbs proposed opening a “commercial school”. Shortly after 1842 the Church of England built a school on their land. So it seems at one time there may have been four schools in Russell. After Russell’s sacking and evacuation on 11 March 1845 and the following war, residents were reluctant to return to Russell. Sadly, the Catholic Mission was moved to Auckland forcing the closure of their small school and, without clergymen, schooling came to a standstill. Although the Church of England schoolhouse survived it remained empty till 1854 when it reopened as a boys’ school. A former member of Sir George Grey’s staff became its first headmaster. Mr. Gould, married to Fanny, James Ready Clendon’s daughter, was an exemplary teacher. Word spread of his teaching style and Auckland parents enrolled their children in Russell School. During this time Russell girls attended a small school at Tapeka. After Mr Gould left in the 1860s schooling continued under a steady stream of teachers. In the 1870s the price of an education was one shilling a week. Under the Education Act in 1877, Russell School became a state school and the old schoolhouse was later removed. 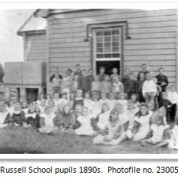 For ten year Russell children attended a temporary Education Board school erected at the north end of Russell Beach. In 1892 the present Russell School was ready for use.